How Manolo Starts Young Horses: A Patient Process of Building A Strong, Healthy Body and a Willing, Content Mind. Topaz is 3 years and 3 months and starting to come to the arena more regularly for 10 minutes or so of training a few times a week. Over the next several months, the goal is to develop his fitness, strength, balance, rhythm and willingness before introducing a rider. When that happens will be based on how Topaz is doing, not on any rigid schedule of when a horse should do what. Manolo wont start some horses until they are 5 and more. It depends. Manolo walks Topaz around the arena at first but also in between bits of lunging. He walks him in both directions and will also walk across the diagonal to change direction on a circle/oval so that Topaz’s body has the time to re-organize and be nice and supple to accommodate a different bend. Manolo also varies the size of his circles and ovals and uses the whole arena as Topaz w/t/c. This variety of figures creates changes in posture that are very good to develop a supple horse with fit, pliable and elastic muscles. He does not keep him on a 20 meter circle or ask for rapid fire transitions. But back to walking around the arena. Manolo uses this time to connect and establish a calm, learning mood, knowing the young horse has a limit to how long he can focus. There is purpose in these walks. Manolo stays aware of Topaz’s posture and balance, making sure he gently keeps him in a good alignment and walking in a clear, even rhythm. He walks either behind him in a modified form of long lining, from both sides and sometimes facing Topaz as he walks backward. These different vantage points allow him to observe Topaz’s and look at how straight he is and how evenly he uses his limbs. Based on what he sees, he make small adjustments as needed in Topaz’s posture and movement as he moves nicely, with good energy. To suggest changes in posture or movement, Manolo uses a long and thin bamboo which Topaz is very familiar with and utterly unafraid of. This is a useful tool that creates a physical connection between handler and horse when it rests on Topaz’s neck or his quarters sometimes giving the young or nervous horse more confidence, sometimes just helping guide and shape posture, movement, balance and straightness. A long and thin bamboo also makes it easy for Manolo to touch Topaz’s legs or body very accurately. 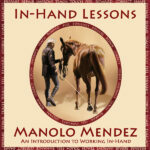 There is no hitting the horse as the last thing Manolo wants is to instill fear in Topaz and open the door to tension which could lead to stiffness, unwanted muscle memory and postural reflexes that will slow down the training considerably in future as they will need undoing. Manolo does not discourage Topaz from being curious and looking around and outside. He is patient with him and enjoys being with him. This helps build Topaz’s confidence in himself and Manolo. Another important element of this early training is offering pauses. Not too long and not too short, they allow the young (and adult) horse to process and assimilate information. Manolo finds horses retain new lessons better when they are short and interspersed with restful pauses. During these pauses, sometimes Manolo will stay away and give the horse his space and sometimes he will come over and put an arm over the horse’s neck or back and stand together companionably and quietly. When and what he does depends on the horse, the day, the mood, the lesson. “It depends” is a standard Manolo answer. Holding the tail is also is a means to create another physical link and let the young horse know where the handler is. Does the young horse react defensively, clamp his tail, threaten to kick, or does he continue to walk unperturbed with a soft tail? Yielding his quarters easily? These are all clues to how the horse feels internally and physically. Finally, Manolo uses the cavesson and lunge carefully. He does not drag or confine Topaz but gives him enough room so that while he is able to guide him he also lets him use his body and especially his neck without restricting its natural motion. He does this in order to help Topaz develop independent balance. This young horse is quite naturally supple and balanced and Manolo’s goal is to enhance these gifts and avoid introducing blockages, tension and stiffness into the work.